The scale-invariant feature transform (SIFT) is an algorithm used to detect and describe local features in digital images. It locates certain key points and then furnishes them with quantitative information (so-called descriptors) which can for example be used for object recognition. The descriptors are supposed to be invariant against various transformations which might make images look different although they represent the same object(s). More about that below. This page tries to describe the main ideas of SIFT visually and interactively. 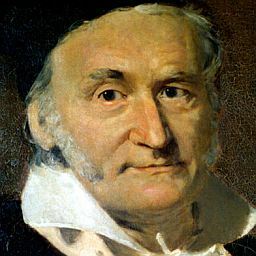 We start with the picture you provided or with our default picture, a portrait of Carl Friedrich Gauß. (Or actually we start with the 128x128 version you see at the top of the page. We might have shrunk your original picture in order to keep the size of this page manageable). The algorithm first doubles the width and height of its input using bilinear_interpolation. That's the first picture above, the one in its own row. This picture is subsequently blurred using a Gaussian convolution. That's indicated by the orange arrow. What follows is a sequence of further convolutions with increasing standard deviation. Each picture further to the right is the result of convoluting its left neighbor, as indicated by the green arrow. What we now have constructed is called a scale space. The point of doing this is to simulate different scales of observation (as you move further down in the table) and to suppress fine-scale structures (as you move to the right). Now for the next step. Let's imagine for a moment that each octave of our scale space were a continuous space with three dimensions: the x and y coordinates of the pixels and the standard deviation of the convolution. In an ideal world, we would now want to compute the Laplacian of the scale-space function which assigns gray values to each element of this space. The extrema of the Laplacian would then be candidates for the key points our algorithm is looking for. But as we have to work in a discrete approximation of this continuous space, we'll instead use a technique called difference of Gaussians. For each pair of horizontally adjacent pictures in the table above, we compute the differences of the individual pixels. If you click on one of the pixels above, you will see below how the difference for this individual pixel was calculated. You'll see a clipping of the difference image in the middle while to the left and right you'll see the corresponding clippings from the two scale space images which were subtracted. Note that bright spots in the difference image mean there was an increase in brightness while dark spots mean the opposite. Medium gray (see the marker in the gray chart above) indicates that there was no change. The discrete extrema of these difference images will now be good approximations for the actual extrema we talked about above. A discrete maximum in our case is a pixel whose gray value is larger than those of all of its 26 neighbor pixels; and a discrete minimum is of course defined in an analogous way. Here we count as "neighbors" the eight adjacent pixels in the same picture, the corresponding two pixels in the adjacent pictures in the same octave, and finally their neighbors in the same picture. The extrema we've found so far will of course have discrete coordinates. We now try to refine these coordinates. This is done (for each extremum) by approximating the quadratic Taylor expansion of the scale-space function and computing its extrema. (The gradient and the Hessian are approximated using finite differences.) This is an iterative process and either we are able to refine the location or we give up after a couple of steps and discard the point. You can click on the key points above to see in the table below how their scale-space coordinates have been refined. The algorithm now assigns to each remaining key point its reference orientation, if possible. Very roughly, we observe all gradients in the direct neighborhood of such a point and see if many of them have approximately the same direction. Key points near the image border which don't have enough neighboring pixels to compute a reference orientation are discarded. Key points without a dominating orientation are also discarded. On the other hand, key points with more than one dominating orientation might appear more than once in the next steps, namely once per orientation. If you click on one of the key points above, you will see below to the left the part of its neighborhood that was investigated and the reference orientation that was computed. To the right, you will see the (smoothed and normalized) histogram from which this orientation was derived. We now have our final set of key points (well, almost) and will, as the last step, compute the descriptors for each of them. This step is pretty similar to the one above. We will again compute a histogram for the distribution of the directions of the gradients in a neighborhood of each key point. The difference is that this time the neighborhood is a circle and the coordinate system is rotated to match the reference orientation. Also, the full truth is that we not only compute one, but rather sixteen histograms. Each histogram corresponds to a point near the center of the new coordinate system and the contribution of each gradient from within the circle-shaped neighborhood is distributed over these histograms according to proximity. Key points are extracted at different scales and blur levels and all subsequent computations are performed within the scale space framework. This will make the descriptors invariant to image scaling and small changes in perspective. Computation relative to a reference orientation is supposed to make the descriptors robust against rotation. Likewise, the descriptor information is stored relative to the key point position and thus invariant against translations. Many potential key points are discarded if they are deemed unstable or hard to locate precisely. The remaining key points should thus be relatively immune to image noise. The histograms are normalized at the end which means the descriptors will not store the magnitudes of the gradients, only their relations to each other. This should make the descriptors invariant against global, uniform illumination changes. The histogram values are also thresholded to reduce the influence of large gradients. This will make the information partly immune to local, non-uniform changes in illumination. The algorithm used here is based on Anatomy of the SIFT Method by Ives Rey-Otero and Mauricio Delbracio.